On the night of July 5th and morning of June 6th, on the basis of a reconnaisance by the enterprising Lieutenant Colonel John Harvey and local scout Bill Green, the British, using 700 soldiers of the 8th and 49th Regiments, decided on the risky and unorthodox approach of a surprise night attack on the more numerous 3000 American troops. The American sentries were located and bayoneted silently with quick dispatch. The British then charged the American lines sending the enemy into full flight. The War of 1812 was not dull stuff! The British troops then returned to Burlington Heights while the Americans retreated east all the way to 40 Mile Creek. Stoney Creek was important in the outcome of the War, as it prevented a fatal split in the British forces in Upper Canada, and forced the Americans to return to the Fort George area. 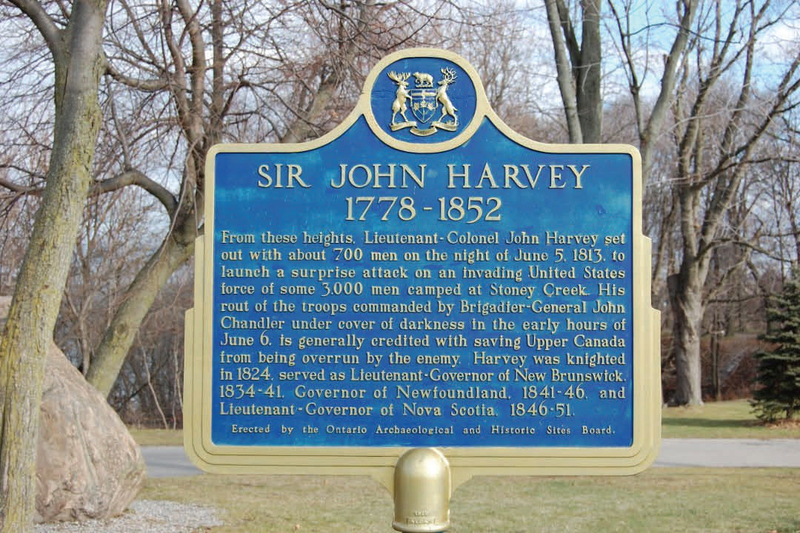 John Harvey later became well known to Newfoundland as Governor. Harvey Road in St. John's is named in his honour.